Uke Player Rae Carter gets a record deal! I am delighted to be posting this on the blog. Ukulele player Rae Carter, who I am hooked up with on a variety of uke sites and social networks has got him self a recording contract with Quay West Studios in Gosport UK. Rae has not actually been playing the uke that long (couple of years) but in time i've been following him, i've seen his talent grow and grow. 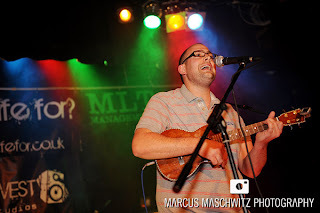 He's got a great style with the uke and is now progressing to writing his own songs. In fact, he seems to be banging out songs at a hell of a rate so he's clearly got the knack! I want to wish Rae the very best of luck and would urge you to check out his videos on his Facebook Page. Watch this space for news on his recordings. In the meantime, you can read more about Quay West Studios below. Quay West studio,s now a popular name not only within Gosports musical community but reaching out further and wider across the south. Originaly a small studio in the front room of WiLF? Drummer; Alex Long, he recorded notable local musician Nick Bowen Snr. After a conversation between them both, they decided on what Gosport needs is a fresh new take on recording . A year on after teaming up with well known local business man, Rod Callaby and bringing in a select group of enthusiastic music lovers who all share the same passion, forming the foundations of a central hub for musicians. With many ideas brought to the table, Quay West studios have turned them into reality, not only do we offer Recording time and rehearsal space, there is an in-house Record Label, Booking agent and Band Management company offering support and an identity to bands and artists furthering them in their music career…But that’s still not everything! We have been dubbed “Gosports musical hub” for the fact we are a central hub to musicians. We run various musical tuition courses, help and advice to bands, gear hire, merchandise for bands covering pretty much anything you can think of!...Anything! We are proud of this title and wish to sustain it and we’re ever thinking of new ways to build on it. With foundations in music as strong as ours, you can be confident that we can build on up infinitely. All the team at QW studios & records are dedicated in getting the scene alive, offering musicians/bands/artists the chance to showcase their music and various venues and promoters we have teamed up with. It’s now an exciting time for all of us and now we have taken on Rae Carter our aim is to further him and aid him in the direction that he wants his music career to go, giving him a platform and a base within the music world.